Binary Scam Alerts would like to take you to a trip down memory lane and remind you that the Easy Wealth Creator as Well as Sean Willows is a SCAM and a rehash of the old Coffee Cash Cheat software, auto-trader, and app. Don’t be fooled by fake reviews or less-than scrupulous marketers giving their seal of approval for this nasty little scheme. Our staff has received a fresh flurry of SPAM emails promoting this misleading and deceitful offer, and complaints from furious day traders are coming in by the dozens. So naturally we have conducted a full review and investigation into this system and as to be expected the findings are conclusive and undeniable. The Easy Wealth Creator is a confirmed binary options investment SCAM. Just look at our Coffee Cash Cheat review dated December 1, 2015. You will see its the same cheap actor selling you the same trashy app using the exact same sales pitch. Someone here failed to do their due diligence and miscalculated the possible outcome of being publicly exposed in the most aggressive and uncompromising way. I must admit, whenever I am faced with these sub-par apps I try to imagine what in the world the people behind it thought about before going live with their bogus offer. The binary options industry is a heavily saturated and competitive environment where even the best and most accurate, transparent, and profitable systems are subject to intensive grilling and testing by an army of consumer advocacy sites. I honestly believe that going into the actual software and conducting a performance test will contribute more or change the outcome of this review, and even if we wanted to we couldn’t because as the image above illustrates you will not even be able to complete the registration process. So at this point we have simply decided the evidence is compelling and leaves no room for misinterpretation or hesitation. The promise of making $13,874.71 Cents daily “guaranteed” is not laughable! It should get you upset and motivated to report these people to the authorities for violating a series internet crimes starting with false advertising, and violating the CAN-SPAM act by falsifying header information, using deceptive subject lines, and not respecting customers requests to unsubscribe from emails. As I mentioned, making this kind of money takes time and requires a learning curve. The so-called “push button” profit system making you auto-pilot earnings while you live your life and spend time with your family or friends does not exist. Making money takes hard work, talent, dedication, and perseverance. Anyone telling you the opposite is making a buck on the back end or has a hidden agenda. Furthermore, with this piece of trash code the most insulting element has to do with the fact that these people were too lazy or cheap to come up with something real or at least original so they just rehashed an old sales pitch, gave it some new graphics and a new name and voila, a new system has just arisen from the ashes and is ready and willing to offer you fools gold if you would just take the bait and invest some money. Not really, you would need at least $250 and that fee will be collected through one of their shady, unregulated brokers. These include but are not restricted to: The Binary Interceptor, Lie Detector Millionaire, The Free Money System with Walter Green, Profits Infinity, Cloud Trader, The Money Glitch, Hedge Formula Group, the Push Money App with Dennis Moreland, Amissio Formula, TradeTracker Pro, Millionaire Blueprint, Trianasoft, Quantum Income Machine, Regal Wealth, and Insured Profits with Dave and Ginny. Our recommended section offers the best and most reputable trading systems available today. They all pass a rigorous credibility test and re-evaluated on a daily basis. 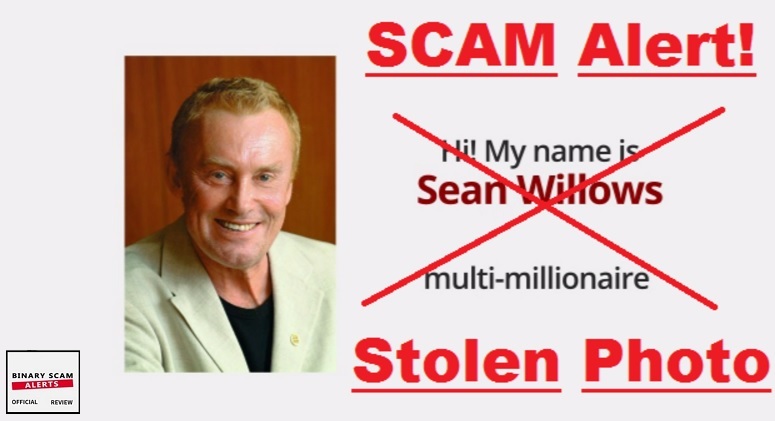 The Easy Wealth Creator software, app, and auto-trader, as Well as Sean Willows the fake actor is a verified binary options investment scam. There is not one thing which is genuine, sincere, or honest about this cheating app and if you are tempted to buy into it there is no possible way to win or get your money back so be warned and use extreme caution because your money will be stolen. As always feel free to contact us through our Facebook group or YouTube Channel to get informed.